Put Gorilla Glue to work on repair projects around the plant. 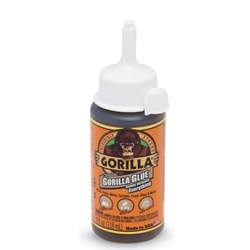 Original Gorilla Glue is ideal for almost any repair. Water activated‚ it expands into materials to form a strong bond to virtually anything. Glue dries in 1-2 hours with full cure after 24 hours. Can be sanded‚ painted or stained after application.